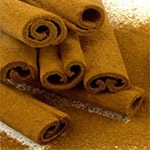 WEDNESDAY, Oct. 16, 2013 (HealthDay News) -- Cinnamon has long been used to add flavor to sweet and savory foods. Now, preliminary research suggests the spice may also help jump-start irregular menstrual cycles in women affected by a common infertility disorder. A small study by researchers from Columbia University Medical Center in New York City found that women with polycystic ovary syndrome who took inexpensive daily cinnamon supplements experienced nearly twice the menstrual cycles over a six-month period as women with the syndrome given an inactive placebo. Two of the women in the treated group reported spontaneous pregnancies during the trial. "There is a lot of interest in homeopathic or natural remedies for this condition," said study author Dr. Daniel Kort, a postdoctoral fellow in reproductive endocrinology at the medical center. "This may be something we can do using a totally natural substance that can help a large group of patients." The study was scheduled for presentation at a meeting of the International Federation of Fertility Societies and American Society for Reproductive Medicine in Boston. An estimated 5 percent to 10 percent of women of childbearing age have polycystic ovary syndrome, with up to 5 million Americans affected. Polycystic ovary syndrome, which involves many of the body's systems, is thought to be caused by insensitivity to the hormone insulin. Typical symptoms include menstrual irregularity, infertility, acne, excess hair growth on the face or body, and thinning scalp hair. Treatment for polycystic ovary syndrome currently includes weight loss, ovulation-inducing drugs such as clomiphene (brand name Clomid) and diabetes medications such as metformin, said Dr. Avner Hershlag, chief of the Center for Human Reproduction at North Shore University Hospital in Manhasset, N.Y.
Kort said that it's not yet clear exactly why cinnamon may work to regulate menstrual cycles in those with polycystic ovary syndrome, but it may improve the body's ability to process glucose and insulin. Prior research among diabetic patients suggested the spice can reduce insulin resistance. Of the 16 patients who completed Kort's trial, 11 were given daily 1,500-milligram cinnamon supplements and five were given placebo pills. Diet and activity levels were monitored, and patients completed monthly menstrual calendars. After six months, women receiving cinnamon had significant improvement in menstrual cycle regularity, having an average of nearly four menstrual periods over that time compared to an average of 2.2 periods among the placebo group. Two women reported spontaneous pregnancies after three months of cinnamon treatment, meaning they became pregnant without additional help. Polycystic ovary syndrome "is one of the most common causes why women don't have regular menstrual cycles," Kort said. "But the clinical consequences later in life are truly great -- from an increased risk of diabetes and glucose intolerance to endometrial cancer. Many women can go their whole lives without regular menstrual cycles, and it doesn't necessarily bother them until they want to have children." The 1,500-milligram cinnamon dose was chosen for this trial because it was between the 1,000 to 2,000 mg daily that seemed to have metabolic effects on diabetic patients in earlier research, Kort said. But all doses in that range are cheaply obtained, costing pennies per capsule. "Compared to most medical therapies these days, the cost is very small," he said. Although the study suggests a link between cinnamon and improvement of polycystic ovary syndrome, it doesn't establish a direct cause-and-effect relationship. Still, Hershlag called the study "welcome and interesting" and said he sees no reason women with polycystic ovary syndrome shouldn't use more cinnamon in their food or take cinnamon supplements. "Any work that's something nutritional in nature and seems to affect the abnormal physiology of polycystic ovaries is welcome," Hershlag said. "If they want to spice up their life and take it, that's fine . . . but I think the best thing to do when you have polycystic ovaries is to be under the control of a physician." Some women with polycystic ovary syndrome from Kort's clinic are already trying cinnamon supplementation at home in the hopes of regulating their own menstrual cycles, he said, although he acknowledged the spice wasn't likely to be a cure-all for the condition. "It's unlikely to be the sole source of improvement or to change entire (treatment) protocols," he said. "It's not going to regulate every patient who takes it, but a good percentage who take it may experience some benefit, and the side effects are low. It's relatively cheap and well tolerated." Some day, Kort added, he hopes to organize a larger trial examining the issue. Data and conclusions presented at scientific conferences are typically considered preliminary until published in a peer-reviewed medical journal.